Dr. Who & The Daleks brought the legendary BBC sci-fi series to the cinematic big screen in glorious Technicolor and widescreen in Aug 1965, followed a year later by Daleks’ Invasion Earth 2150 A.D. Released for the first time on CD, here are the soundtracks to both films including sound effects and contemporary single releases. 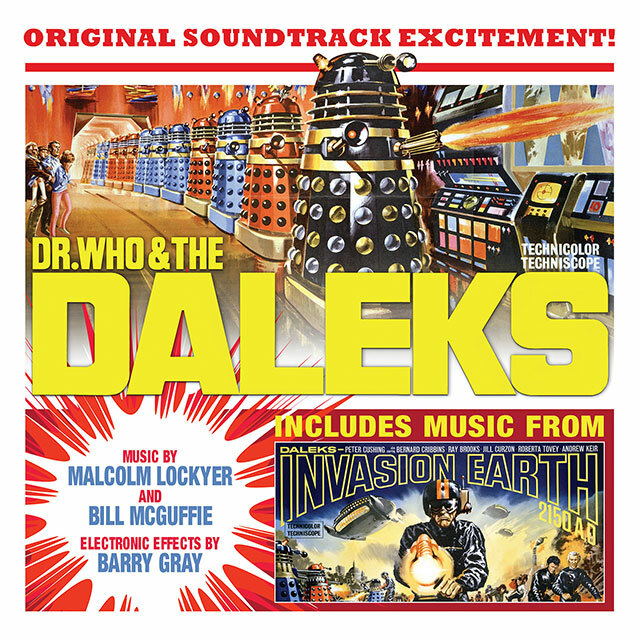 The vibrant period scores written by Malcolm Lockyer and Bill McGuffie, have sections enhanced by electronic sounds created by Barry Gray, famed for his work with Gerry Anderson. Lovingly restored from the vaults of Pinewood Studios, this project had been eagerly awaited for many years by Doctor Who and sci-fi fans.